Hi guys, first time posting a deal. 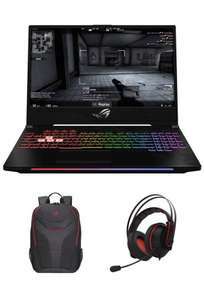 I’ve been looking for a gaming laptop for a while now and this is a very good deal in my opinion. You can even price match with Currys if you would prefer to get it from there, they confirmed on live chat for me. Full GTX 1070 8GB for £1400 and comes with backpack and headset! Ok price considering it has a 512gb ssd. I didn't but a family member did. Yh it would be irrelevant but you dont know if its all cancelled. A family member of mine still has his as ordered. Yeah, the chances of cancellation is high but doesn't mean its all been cancelled. Thought about that one myself for a while. Didn’t go for it because the RTX 2060 doesn’t perform as good as the GTX 1070, the screen is 60hz(UK hasn’t got the 144hz screen yet for some reason) and cooling issues. Yh it would be irrelevant but you dont know if its all cancelled. A family …Yh it would be irrelevant but you dont know if its all cancelled. A family member of mine still has his as ordered. Yeah, the chances of cancellation is high but doesn't mean its all been cancelled. Why not if you can help primary message wasnt out there to have a dig at you, incase it was seen that way. Why not if you can help primary message wasnt out there to have a dig …Why not if you can help primary message wasnt out there to have a dig at you, incase it was seen that way. According to the other thread all orders before 8:42 were honoured and one …According to the other thread all orders before 8:42 were honoured and one person's has already arrived. Deal posting newbie! This is Morxban first deal post. Help out by leaving a posting tip or just to show your appreciation for their contribution.